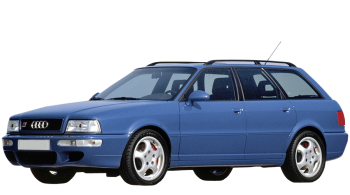 In 1993 Audi launched manufacture of automobiles model 80 Avant, modification S2 Quattro and terminated it in 1995. This automobile has five doors, the body chassis is shaped like a wagon, weight 1.5 tons and length 4.5 meters, which can seat 5 people total. «80 Avant S2 Quattro» vehicle with a 6-speed manual transmission is connected to the full-wheels. The 5-cylinders petrol motor with «multipoint injection fuel system» can generate power 230 horsepower at 5900 rmp, which allows you to speed up the auto in 6.1 seconds to 100 km/h and reach max speed of 242 km/h. Normal fuel consumption is 10.3 liters per 100 km. Gas tank volume is 64 liters of petrol, what allow you to go nearly 622 km unrefuelled. The forward wheels of this automobile have ventilated disks brakes and attached to the chassis with help of suspension «MacPherson, independent, coil springs» and equipped with anti-roll bar. Back wheels have disks brakes and attached to the chassis by dint of suspension type «Double wishbone, independent, coil springs» and equipped sway bar. Tires have the following size - 205/55ZR16. Audi 80 Avant is not examined for Euro NCAP crash test. In addition to active safety systems (ABS), it is also equipped with passive safety systems (driver airbags).